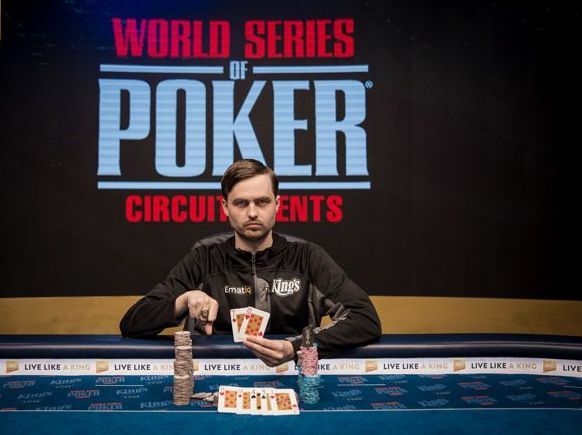 The new champion of the World Series of Poker International Circuit Rozvadov has been crowned! Martin Brhel managed to win the €1,700 Main Event and earned a total of €190,000. Furthermore, he also won additional prizes which include a ticket to the WSOP Europe Main Event and a WSOP Circuit Ring. This is not his first WSOP ring, as this experienced player managed to win four others before this one. The Main Event hosted a total of 650 entries who barely managed to meet the guaranteed prize pool, which was €1,103,500. Kabrhel is on his home ground when playing at the King’s Resort in Rozvadov, as he comes from the Czech Republic. The cash prize he managed to win is his second-biggest of all time. At the moment, Kabrhel has more than $8 million in live tournament cash earnings. What’s more interesting is that more than 50% of his live earnings were won in World Series of Poker events. A total of 23 players returned on the last day in order to try and win the first place prize in the main event. After some great poker action, the final table was formed with an average of 36 big blinds. The two players that had twice the average were Jakub Oliva and Martin Kabrhel, and they soon turned out to be the most successful players in the final table. The first one to hit the rail was Raz Alon from Israel, who won a total of €20,881. He was soon followed by Daniel Smiljkovic from Germany, who managed to cash out €29,951. Martin Mulsow, who is also from Germany, ended up in sixth place with a total of €39,777 in his pocket. The fifth place was reserved for a player from the Czech Republic called Robert Skopalik, who won €50,78, and the fourth place belonged to Andreas Heider, a German player who won €64,500. Although Jakub Oliva started the final table with a lot of chips, he ended up in third place, winning a total of €80,000, and leaving Harry Ross from the UK and Marin Kabrhel to compete for the final prize. The heads-up play did not actually last very long. Although Ross was able to double up early on, it was over for him only a couple of hands later. During the last hand, Kabrhel had a ten-seven against Ross’ six-five. The flop showed eight-nine-four, and Kabrhel managed to create an open-ended straight draw. The turn provided Ross with a straight draw too, but the jack that appeared on the river was the decisive card which helped Kabrhel win the tournament. The two players hugged it out as they both managed to do well in the end.